Instructions: Card Base is 5 x 7" on white card. 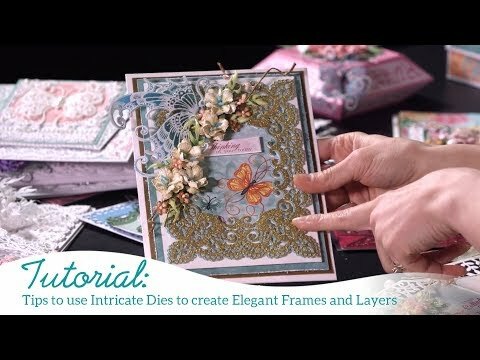 Cut out the Intricate Swirl Frames Die on white card. This includes the large die and the delicate insert. Foam the Large intricate frame on the card base. Cut a pattern paper from the butterfly dreams measuring approximately 3.75 x 5" to go inside the stitched insert. Place the insert of the intricate frame in white on top of the pattern paper as shown in my sample. Wrap ribbon around the pattern paper and tie in a bow. Insert two trinket pins into the knot and wrap gold thread around the knot in the ribbon. Attach this to the card base. Cut and stamp two sets of the Wildwood Florals on white card using coffee archival ink. Color centers with sunflower archival ink and outside with a dab of Victorian velvet and sunflower. Pierce with paper piercer in center to make room for the stamens. Then mold using shaping mat and stylus. Cut and stamp 2 sets of the Classic Rose Vine on white card using coffee archival ink, color with leaf green and fern green archival inks. Cut out one set of the smallest wildwood florals, we will use these as fillers. Use the wire cut off from the stamens to add some detail by wrapping this around your stylus and tucking this in between the flowers and leaves. Detail the flowers with Crystal Clear. From the insert of the delicate die, stamp the sentiment from the words of encouragement set using Black Memento Ink and center this. We will pop this on top of the card base and build our flowers and classic rose vines around as shown.